Kartemquin Films is proud to reveal news of our co-production deal with Mara Films on Eating Up Easter, an in-progress documentary that was today announced as a selected project of the prestigious Hot Docs Forum, taking place over May 3-4 in Toronto during the 2016 Hot Docs festival. 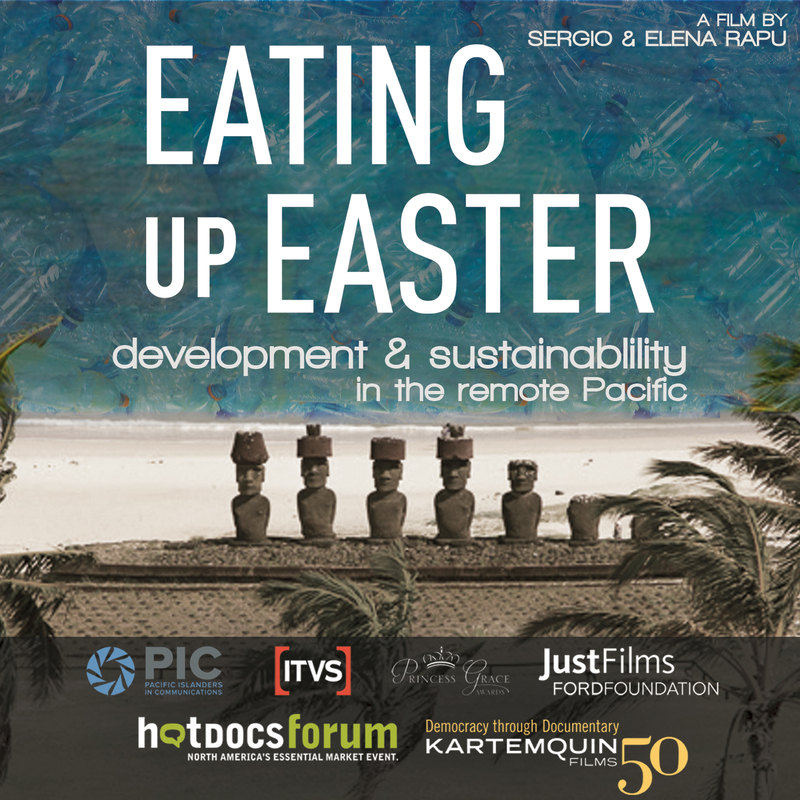 In Eating Up Easter the most isolated community in the Pacific uses lessons learned from their past to solve environmental and social challenges brought on by booming tourism and rapid development. Director Sergio Rapu, the only native Easter Islander to be actively working in production in an English speaking country, and his wife and producing partner Elena Rapu have been in production on the documentary since 2014. Now residing in Minneapolis, they brought the film to Chicago-based Kartemquin in 2015. The Hot Docs Forum sees 19 pre-selected international projects pitch to a table of leading commissioning editors, film fund representatives, financiers, programming executives and delegates from around the globe. Recent successful forum projects have included Frederick Wiseman’s In Jackson Heights, Jason Osder’s Let the Fire Burn, and Morgan Neville and Robert Gordon’s Best of Enemies. "A partnership with Kartemquin and an invitation to the Hot Docs Forum means that small community on Easter Island will have an international stage to speak at,” said director Sergio Rapu. “Easter Island is much more than just tourism destination, and this documentary is an opportunity to show our present day struggles - and the opportunities for sustainable solutions - to a global audience." Kartemquin, celebrating their 50th Anniversary as a not-for-profit documentary collective in 2016, is best known for producing the majority of films by 2016 Hot Docs Career Achievement Award Winner Steve James, including the multi-award-winning Hoop Dreams (1994), The Interrupters (2011), and >Life Itself (2014). Initial funding for the project has been received from Pacific Islanders in Communications, JustFilms / Ford Foundation, the Princess Grace Foundation-USA, and the ITVS Diversity Development Fund. Find out more about Eating up Easter: www.eatingupeaster.com.